You can view all transactions made with WordPress.com, including payments and refunds, in your Billing History. From the Profile page, select Manage Purchases on the left and then Billing History from the top menu. Click on Date to select a time frame to show transactions from. Click on Email Receipt to email yourself a copy of the receipt. The receipt will be sent to the email address in Account Settings. Click on View Receipt to view more information about that transaction. When viewing a receipt, you can add information under Billing Details before printing the receipt. You can also find information about your upcoming charges for automatic renewal under Upcoming Charges. If you’ve purchased an upgrade for your WordPress.com blog or site, our payment processor has generated a unique transaction ID to identify your transaction. It’s a string made up of both letters and numbers. We may request the transaction ID to look up your purchase, or to verify your account ownership. When you pay for an upgrade we email you a copy of your receipt. If you paid with PayPal, PayPal will also send you a receipt. If you paid using PayPal, the receipt they send you. If you have access to your WordPress.com account, you can view all of your WordPress.com receipts by navigating to the Me section of WordPress.com, choosing the Manage Purchasesoption from the sidebar, and then clicking the Billing History tab. The transaction ID can be found in your WordPress.com billing history. If your statement displays the digits 8772733049 next to the transaction, or no code is present, your payment was processed by PayPal. Please see the following section. 1) To begin, login to your PayPal account. 3) Using the dropdown menus, select the time period in which the purchase was made. You can also specify the type of transaction you’re looking for. In this case, select Payments Sent. 4) Clicking on any transaction titled WordPress.com will show you the details of the purchase. 5) The “Transaction ID” in the receipt is your 17-character PayPal transaction ID. Copy and paste this number where requested, and you’re good to go! Sometimes you need to retrieve your PayPal transaction ID, but don’t have the email receipt. 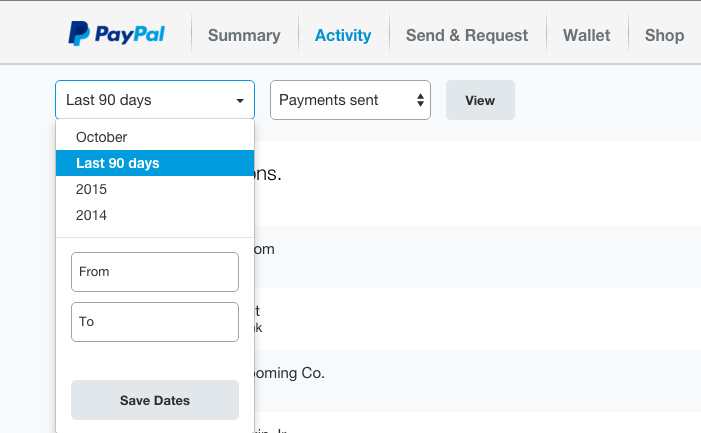 Most WordPress.com payments are processed by PayPal, even if you paid by debit or credit card, so you can contact PayPal directly to get the transaction ID. 1-888-221-1161 from inside the U.S.
1-402-935-2050 if calling from outside the U.S.
You can also visit PayPal’s website for additional ways to contact PayPal. Where are my old transactions? The Billing History page only shows transactions made after September 15, 2009. If you’re looking for information about transactions made before that date, please contact support. My recent transactions are missing. Where did they go? The Billing History page only shows transactions you made with the account you are logged in with. 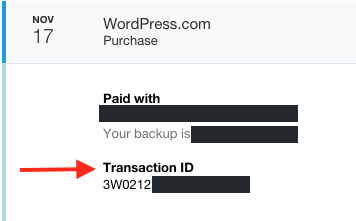 If you made purchases with a different WordPress.com account, you will have to log in to that account to see the transactions in the Billing History. If you’re logged into the correct account and are still missing a transaction, please contact support. How can I cancel and refund transactions from this list? Most of our upgrades are eligible for a 30-day refund period, and can be canceled and refunded from the Purchases page. From there you can cancel and refund eligible transactions, enable or disable Auto Renew, and perform other actions related to your upgrades. To change payment information for an upgrade that is set to renew automatically, use the Purchases page. Select the upgrade you want to edit, and then click on Edit Payment Method. How can I edit the “Billing Details” section of a receipt? To edit the “Billing Details” section on a receipt, navigate to your Billing History page. Click the View/Print option for the receipt you want to edit, and then click on the “Billing Details” section you want to change. Note that this will only change the details in your printed document; it does not permanently change the details in the Billing History. I have an unexpected charge on my credit card or PayPal account. How can I find out more about it? You can find the details of any charge from WordPress.com or our other services at our Why was I charged? page. If you feel the charge was in error, please contact support. We can provide VAT receipts to users who are properly listed in the VIES (VAT Information Exchange System) database. To request a VAT receipt, contact support and provide your company’s name, business address, and VAT number. Once we validate your information a VAT receipt will be sent to the email address on your account.